Thank you for choosing us for your next field trip experience! We can tailor a field trip for any age group and can add a classroom activity using a theme of your choice. 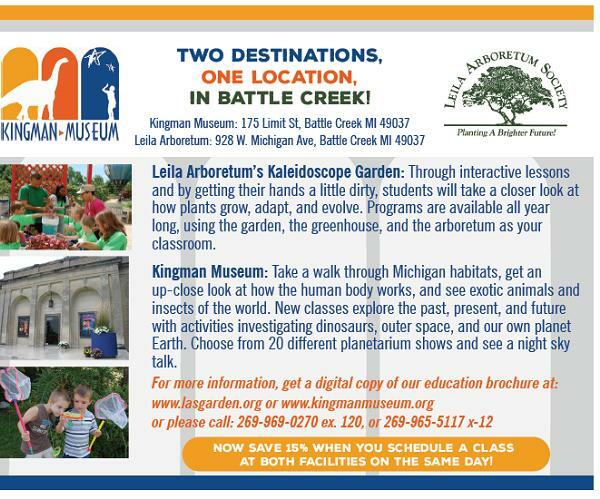 Save 15% when you book a field trip at both Leila Arboretum and Kingman Museum for the same day! Kingman Museum members receive free planetarium show tickets, gift shop discounts, plus free or discounted admission to over 600 ASTC partners across the country and more! Your gift ensures Kingman Museum can continue to offer the best in programs and exhibitions. Kingman Museum members receive free planetarium tickets, gift shop discounts, plus free or discounted admission to over 600 ASTC partners across the country and more! Kingman Museum is a non-profit 501(c)(3) organization.